Most opposition parties have questioned timing of the government’s move, alleging that the bill was moved for political gains ahead of the upcoming Lok Sabha elections. 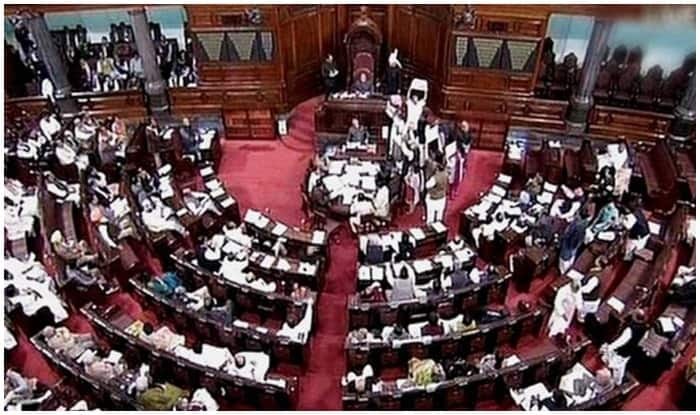 New Delhi: The bill, that seeks to provide 10 per cent reservation in jobs and educational institutions to economically weaker sections in the general category, faced strong opposition from the Congress and other opposition parties on Wednesday in the Rajya Sabha. However, the bill is likely to pass the Rajya Sabha test as despite reservations, key opposition parties like the Congress and the Samajwadi Party said they will support it – as they did in the Lok Sabha on Tuesday. AIADMK, on the other hand, staged a walkout. Soon after ‘The Constitution (One Hundred and Twenth- Four Amendment) Bill, 2019‘ was introduced in the Rajya Sabha, the Congress, DMK, RJD and Aam Aadmi Party reached the well of the House and continued to raise slogans against the government. This was strongly opposed, with Congress member Anand Sharma saying his party supported the bill, and Manoj Jha (RJD) stating the charge was incorrect and that the bill was “interference with the basic structure of the Constitution”. Alleging that the NDA government is resorting to “quota politics”, Sharma questioned the timing of the Quota Bill, moved months ahead of the Lok Sabha polls. “We don’t oppose bill but it needs to be understood it was brought in a hurry,” said Sharma. He further claimed that providing 10 per cent quota to “economically weak” in the general category was not an idea of Prime Minister Narendra Modi but was a part of the Congress’ manifesto of 2014 general elections. Sharma alleged that the government has brought the Bill while there are no jobs available for the youth, adding that PM Modi “dangled a carrot” in front of the public. “The government promised to give 2 crore jobs every year in 2014. Forget about generating jobs, more than 1 crore people lost their jobs in the year 2018 itself. You brought the bill in haste because you had to before the Model Code of Conduct comes into force, thinking that if not 2 crores then let’s dangle a carrot in front of the public, show them another dream that Modi ji made arrangements for their children’s employment,” he said. He further said that the Rs 8 lakh criteria is “unrealistic” and claimed that according to the data, 10 per cent quota would remove poverty in 800 years. To this, Finance Minister Arun Jaitley said that the government had the authority to extend the proceedings of the House when it has to take up important bills. Samajwadi Party leader Ram Gopal Yadav questioned the timing of the Quota Bill, and said that there is no use of reservation as there is no job for the youth. As Yadav raised the issue of Muslim quota, BJP chief Amit Shah interrupted his speech and asked if the reservation for the minority community did not impact the meritorious students. Yadav further said that now when the government has crossed the SC barrier of 50 per cent quota, it should now increase the current 27 per cent reservation for the OBC community to 54 per cent. Earlier, DMK member Kanomozhi demanded sending the Constitution amendment bill to a select committee for further scrutiny and sought division on her motion. While her demand was supported by members of some parties including D Raja (CPI), Samajwadi Party (SP) and Bahujan Samaj Party (BSP) refused to back the demand. In a series of tweets, PM Modi later thanked MPs from all parties for supporting the bill and called it a “landmark moment” that would ensure every poor person, irrespective of caste and creed, to get a life of dignity and access to all possible opportunities.